Have you ever looked for information on your family history? Whether you are simply curious about a few relatives or embarking on an in-depth genealogy research project, there are many online resources that can help your search. If you have relatives from British Columbia, or relatives who are UBC alumni, UBC Library’s Open Collections can be a rich source for your genealogy research. Newspapers are frequently used in genealogy research. Obituaries provide information about individuals’ lives, including birth and death dates, details about careers, and information about other relatives. You can also find birth announcements and other news articles about your relatives. 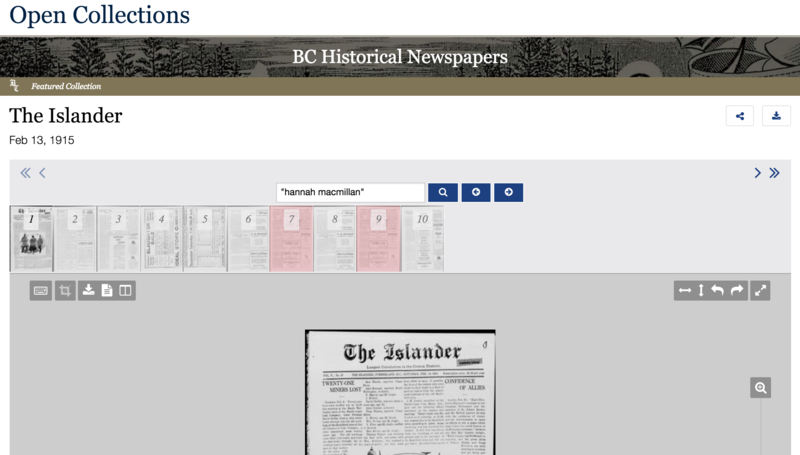 The BC Historical Newspapers collection contains 167 different publications from across British Columbia, with over 47,000 individual papers. The newspapers in the collection date from 1850-1995. Specific date ranges depend upon the paper, and you can check them at a glance here. The BC Sessional Papers collection contains over 3,700 selected provincial legislative documents from 1865-1982. In particular, this collection includes lists of voters by district, records of land sales, and lists of incorporated companies. 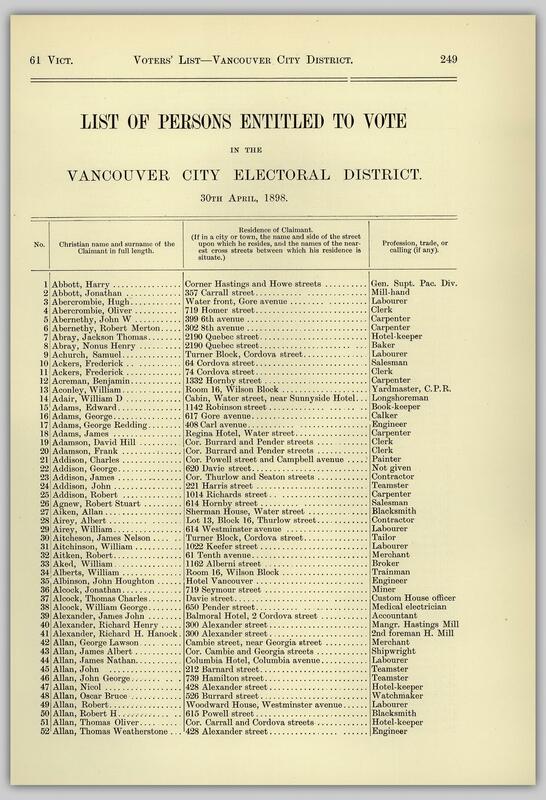 List of Persons Entitled to Vote in the Vancouver City Electoral District. 30th April, 1898. 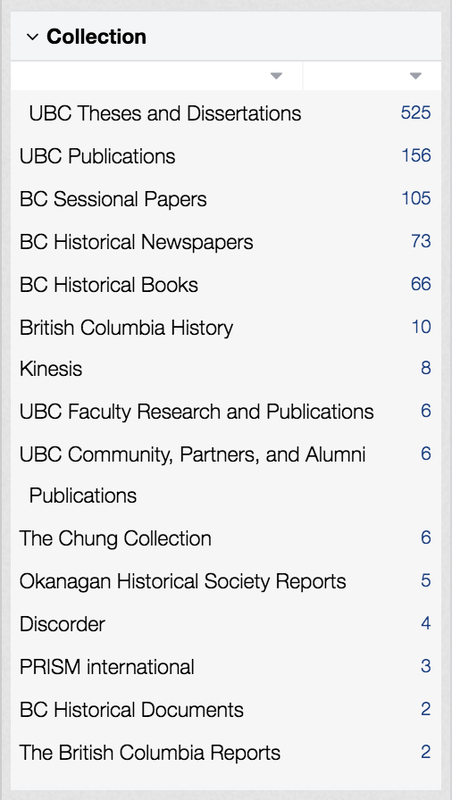 If you have relatives affiliated with UBC, you might find relevant material in the UBC Publications collection. 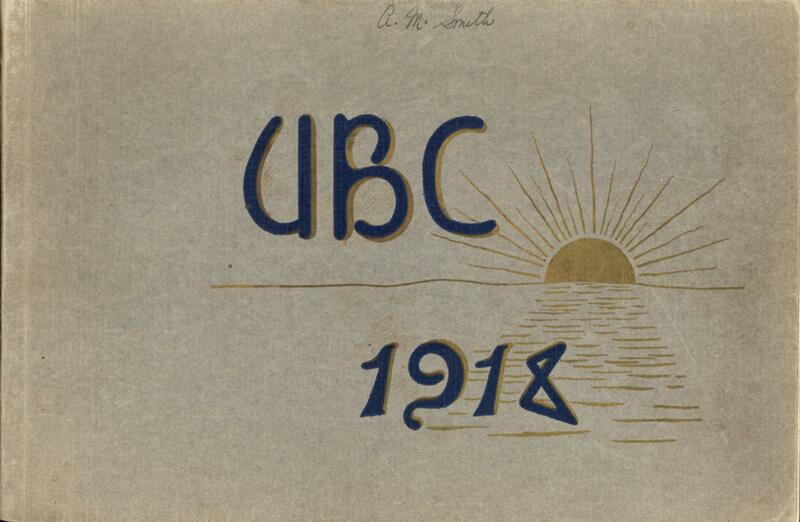 You can explore UBC yearbooks from 1911 to 1966, and look through back issues of The Ubyssey, from the inaugural October 1918 issue to the present. Other publications may also be of interest: you can see the full list on the collection page. The BC Historical Documents collection contains selected documents from the forestry, fishing, and mining industries in British Columbia, education development in the province, and British Columbia’s early history. 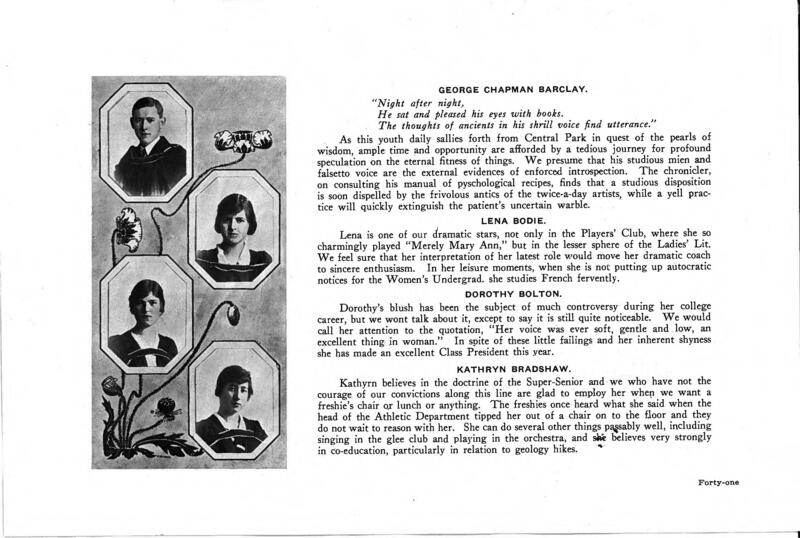 If your relatives attended the Provincial Normal School between 1918 and 1936, you may find them in the selection of digitized yearbooks in the collection. Many of our collections include photographs and correspondence (both handwritten and typed). Depending on your family history, you may want to explore the Japanese-Canadian Photograph Collection, the UBC Archives Photograph Collection, and BC Historical Documents for photographs and correspondence. 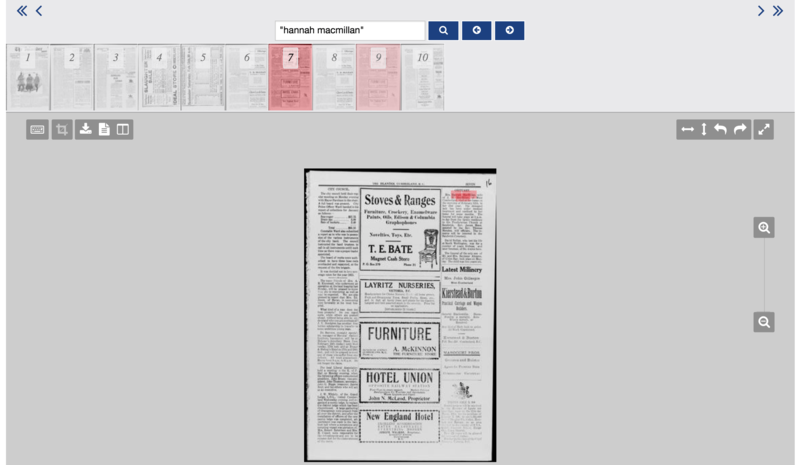 Because all of our text collections have optical character recognition (OCR) applied, keyword searching allows you to search the full text. This applies to newspapers, other publications, and most typed documents, but not handwritten documents. To use the Collection filter, you can start by selecting any of the collections featured above, or other collections that might be relevant to your relative’s life. For the date range filter, note that the end date is January 1st of that year. 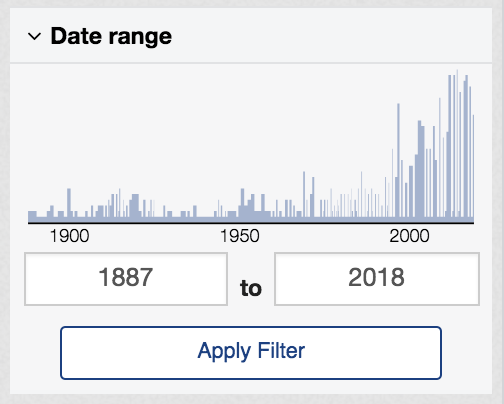 For example, if you want to bring up results from 1890 through all of the year 1920, you would enter 1890 to 1921 in the date range, pulling up results from January 1, 1890 to January 1, 1921. If you know your relative’s full name, as in this example, you will want to use quotation marks. When using quotations, it is important to try several variations, since the full name may not always be printed. For example, Hannah MacMillan could be referred to as “H. 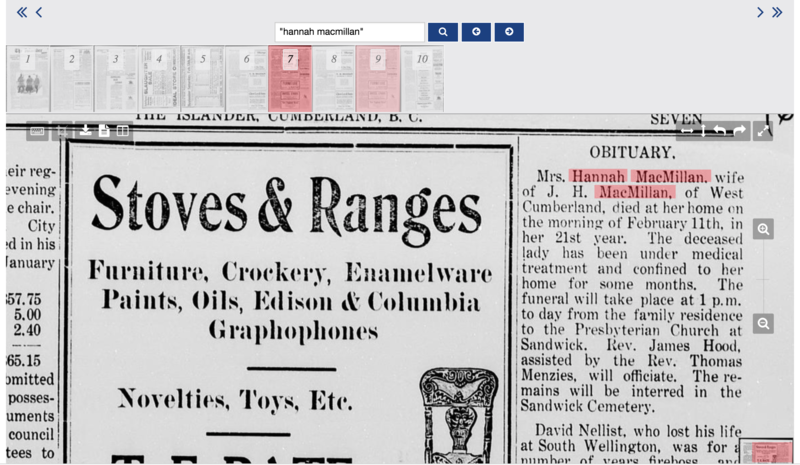 MacMillan”, or her husband’s name could be used – as in, “Mrs. John MacMillan”. You may also want to try a common misspelling, like “McMillan”. Clicking on the result opens up the newspaper. You can zoom in using the buttons on the right to read the section containing your search. The search turned up an obituary for Hannah MacMillan. From this short obituary, you can learn her date of death, how old she was when she died, where she lived, her husband’s initials, and where she was buried. In addition to being key information about Hannah, this information can help you continue your search. Have you used Open Collections for your own genealogy research? Let us know in the comments – we’d love to hear from you! Library and Archives Canada has a Genealogy and Family History section with beginner’s tips, research strategies, and links to resources. The website has pages specific to different provinces and territories, including British Columbia. Wikipedia’s list of record types used in genealogy research can be a source of inspiration for your search. A New Year Calls for a New Impact Report! January 23rd, 2018 by eirian vining | Comments Off on A New Year Calls for a New Impact Report! We are pleased to present the Digitization Centre Impact and Activity Report for 2016-2017! This report highlights the Digitization Centre’s key projects, partnerships and user engagement trends for the 2016-2017 fiscal year. 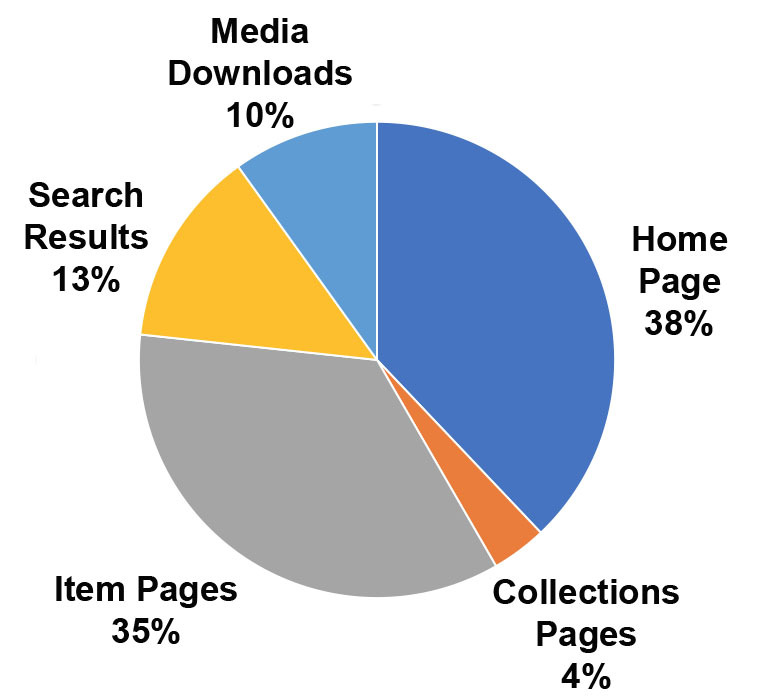 In 2016-2017, Open Collections accounted for 15% of the Library’s unique pageviews. That 15% totals 3.9 million pageviews on Open Collections alone! The breakdown of where those 3.9 million pageviews were spent. Phase IV of the BC Sessional papers was completed, adding material from the Legislative Council of British Columbia from 1933 to 1952. Phase V began in May of 2017. 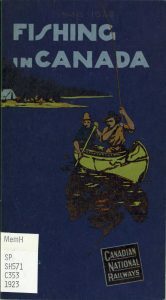 A selection of 23 titles from the Harry Hawthorn Fly Fishing and Angling Collection housed at Woodward Library. An archival collection from the Lake Country Museum and Archives, chronicling one of the first independent fruit ranches in the Okanagan. 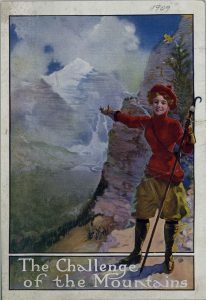 Canada’s first feminist periodical was fully digitized in partnership with SFU Archives and will be available through Open Collections soon. UBC Library acquired and digitized the journal of Susannah Weynton, wife of the captain of the Hudson’s Bay Company supply ship Cowlitz. The BC Newspapers collection was completed this year. Encompassing 163 titles, these newspapers are utilized by researchers around the world. All pages have been run through OCR (optical character recognition) and are full-text searchable. To learn more about what we’ve been up to over the past few years, check out all of our Impact Reports dating back to 2011 under the “Reports” section of our website’s Documentation page. Many thanks to all of our partners over the past years. We look forward to continued collaboration on all of our current and future projects! 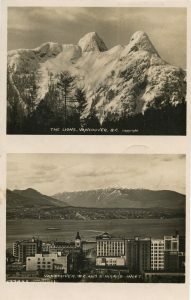 Posted in BC historical newspapers, BC sessional papers, carousel, chung collection, Digitizers' Blog, Hawthorn Fly Fishing and Angling Collection, Pedestal, Rainbow Ranche, Uno Langmann | Comments Off on A New Year Calls for a New Impact Report!